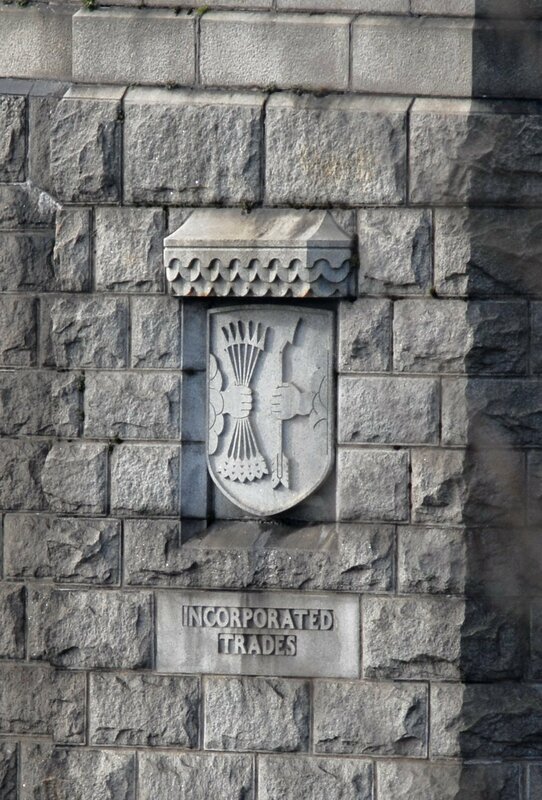 Hidden and unnoticed by the great majority of the population of the city of Aberdeen one of the most substantial granite constructions in the city a number of Heraldic Crests belonging to organisations within the city and county area. The King George the VI Bridge which connects Kincorth and the southern parts of the city to Aberdeen via Great Southern Road was built in the late 1930’s. It was erected to relieve traffic pressure on the 1527 Bridge of Dee as part of a new ap­proach to Aberdeen via a dual carriageway from the Bridge to Holburn Street in the city. Today the bridge carries Great Southern Road into Aberdeen from the south. Compared to earlier bridges or the other surviving bridges over the river, it comprises an elegant four-arch reinforced concrete structure faced with rusticated granite. It was built by local contractors W. J. Anderson Ltd. for Aberdeen Corporation. Consulting architect for the project was Frank C Mears, ARSA, FRIBA and he incorporated eight heraldic carvings on the Bridge, four on either side. 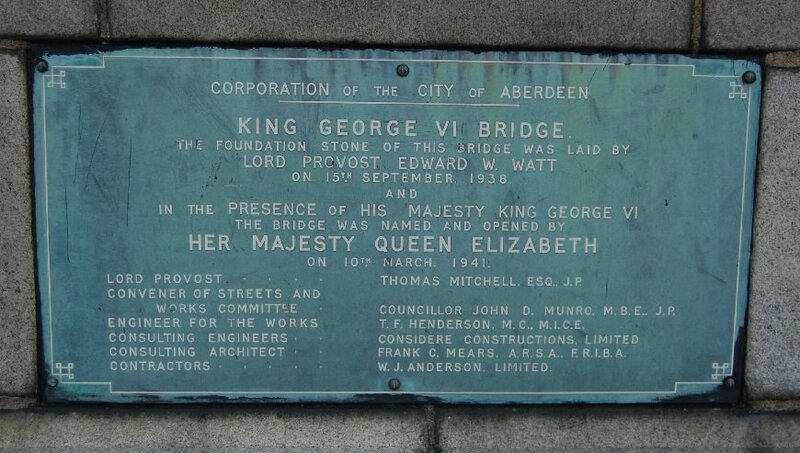 The foundation stone of the bridge was laid by the Lord Provost Edward W. Watt on 15 September 1938. It was officially opened by Queen Elizabeth in the presence of King George VI on 10 March 1941. The bridge design included cast-iron lamp standards bearing the City Arms, which were painted and gilded at the instigation of local artist Eric Auld as an imaginative way of displaying part of the heritage of the city. Positioned alongside and in the central reservation of the dual carriageway a number of these have now been replaced with more modern equivalents and have now been repainted in a single colour.